[ Printed item. ] George Newnes, Limited | Balance Sheet and Directors' Report | For the Year Ended 31st March, 1935. pp., 4to. Stapled pamphlet. Aged and worn, with rusting staples. Two-page 'Directors' Report', with topics including a yearly balance of £134,953 5s 3d, the death of Lord Riddell and the decision to 'rebuild the old-fashioned sections of the Company's premises in Southampton Street, Tavistock Street and Exeter Street; centrefold balance sheet; single-page 'Statement Showing Combined Assets and Liabilities of George Newnes, Limited and Subsidiary Companies'; single-page 'List of Magazines and Periodicals'; and cover page. The subsidiary companies included Country Life; W. H. & L.
[ London bookseller's trade card. ] Unusual and attractive trade card of M. A. Harvey, 'Book & Printseller', with handcoloured engraving of three youngsters looking at his name and address, which are placed on an easel. On one side of 7 x 11 cm piece of card. In good condition, lightly-aged. 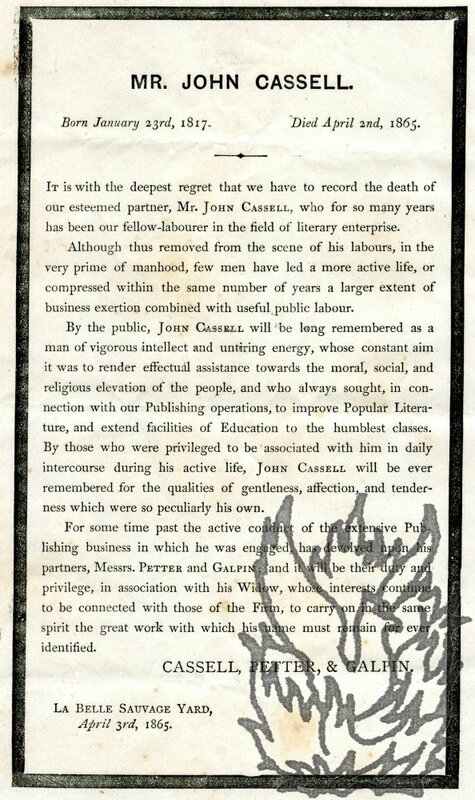 An unusual and attractive piece of London booktrade ephemera. The whole design, including the text, is engraved, and is in the style of a children's book illustration. With the text represented on a piece of board placed on an easel, around which three children crowd. On the left is a girl in a red dress, with yellow bonnet and umbrella, beside her is a louche individual in a yellow and orange checked suit, and to the right is a zouave, with red hat, holding a paintbrush and palette. [International Stores; manuscript] Minute Book No. 1. Pp.1-366 (paginated),, leather binding, bumped and worn, contents sound and in good condition. Registered number of theCompany given on endpaper. Minutes recorded from the beginning of the Company, first meeting of the Directors, Including Kearley and Tonge - a purchase agreement) 17 May 1895 (Contract for purchase, £10,000, etc.). Subjects include: appointment of secretary, Bankers, auditors, allotment of shares, Bank balances, properties (development and expansion), shares, transfers, shop facias ("International Stores"), purchase of peoperties, repairs and renovations. [Thomas Townend & Co., Hatters to the Royal Family.] 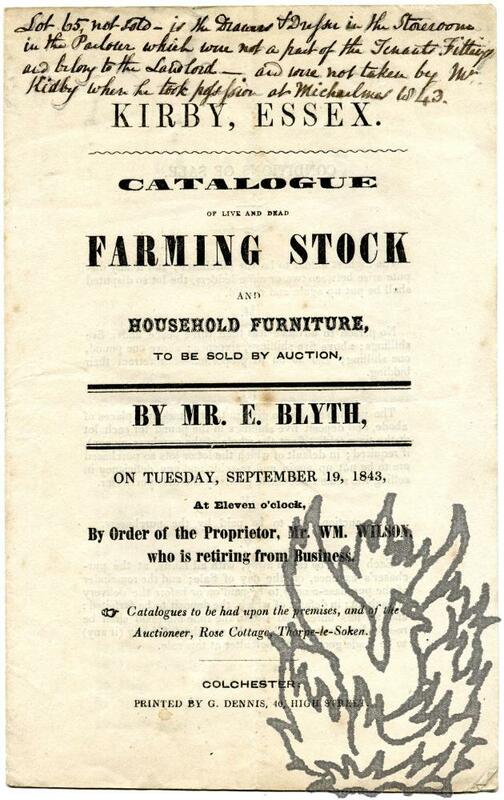 Edwardian trade catalogue, tastefully produced and filled with illustrations of a wide variety of hats and caps. Thomas Townend & Co, Hatters to the Royal Family, 16 and 18 Lime St., London, E.C., established 1778. Thomas Townend & Co, 16 and 18 Lime St., London, E.C. Undated [Printers: Howard & Jones. Litho. London. Entered at Stationers Hall.] [Edwardian]. 12pp., small 4to., on twelve leaves of thick art paper bound with pink ribbon, in blue and brown illustrated chromo-litho covers with flap carrying the royal crest. Internally good, in worn covers repaired with tape. The covers are designed in the distinctive style of the periodThe first eight pages each carry an arrangement of as many as a dozen black and white photographic illustrations of the firm's stock, within a coloured decorative borders (varying from page to page). The last four pages are entirely printed in black. The only text consists of captions to the illustrations. [Samuel Smiles, railway administrator and author of 'Self-Help'.] Autograph notebook, containing information relating to his work as Secretary of the South Eastern Railway, including memorandums, tables and transcripts of letters. Smiles's ownership inscription on fly-leaf: 'S Smiles, South Eastern Railway | 1854.' Entries dating from between 1854 and 1886. According to Smiles's entry in the Oxford DNB, he was 'prominent in the negotiations for the amalgamation of the Leeds and Thirsk Railway [by which he was employed] with the North Eastern, which was effected in 1854 and abolished his own office. Thereupon he left Leeds for London on being appointed secretary to the South Eastern Railway (11 November). He held the post for twelve years, in the course of which he successfully arranged for the extension of the line from Charing Cross to Cannon Street (1858–9). Printed handbill advertisement by 'W & A Gilbey | Wine Growers & Distillers', featuring five engravings headed 'Some Views of W & A Gilbey's Head Establishments'. With list of prices for wines and spirits. Printed on both sides of a piece of wove paper, 30.5 x 22.5. Text clear and complete, on aged paper with slight wear and a few short closed tears to extremities. 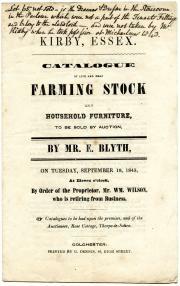 The reverse consists of a list of prices for seven types of wine ('Selected from W & A Gilbey's List of 183 varieties.') and six types of spirit ('Selected from W & A Gilbey's List of 72 varieties.'). On the front, beneath the firm's heading (with tiny illustration of the 'Pantheon A.D. 1722') and Mead's details, are the five 'views', ranging in size from 4.5 x 18 cm to 4.5 x 5.6 cm. [Pamphlet.] Report on Commercial Education. Presented to the Associated Chambers of Commerce. 1887. 52pp., 4to. Stapled. Aged and worn, with slight loss to fore-edge of title. With label, stamp and shelfmark of the Education Department Reference Library. Scarce: no copy in the British Library, and the only copy on COPAC at Leeds. [James Stewart, Cotton Producer and Commission Merchant, Rodney, Mississippi.] Autograph Letter Signed to the Manager, Bank of Scotland, Ediniburgh, describing his business and financial difficulties with cotton planters and the US government. On letterhead from the 'Office of James Stewart, Cotton Producer and Commission Merchant', Rodney, Mississippi. 5 March 1869. 2pp., 4to. On two leaves of aged paper, with loss to margins caused by the items being torn out of the volume in which they were bound. Docketted at head of first page: 'No D. D. in name of James Stewart Rodney Miss from 59 to 69. The letter begins: 'I have been a Customer of the Bank for a number of years. In 1864 I returned to Scotland but came back here in 1865 to try and save some of the large amounts due me by the Planters, and to see what I could do with Several Parcels of Cotton belonging to me, and seized by the U.S. Government. Fifteen Typed Letters Signed from 'Britain's richest man' Sir John Ellerman to Cyril Rollins, regarding Gilbert and Sullivan and the D'Oyly Carte Opera Company. With two Autograph Letters Signed from Lady Ellerman, 13 Christmas cards and other items. Ellerman's letters from Cape Town, South Africa, and the Dorchester Hotel, London between 1960 and 1971; his wife's letters from 1960 and 1973. The thirteen Christmas cards all undated. 35 items, in very good condition, on lightly-aged paper. Ellerman's fifteen letters, all signed 'John Ellerman. ', total: 10pp., 4to; 1p., 8vo; 7pp., 12mo. Rollins was co-author with R. John Witts of 'The D'Oyly Carte Opera Company in Gilbert and Sullivan Operas' (1962), and Ellerman's good-natured correspondence is entirely devoted to the same subject, with references to singers, current productions, historical information and Rollins's 'great book'. Two examples will indicate the tone. On 5 January 1968 he writes: 'I am indeed glad to get a little news of the G. & S. front; Mr. Published on behalf of A.R.Brett &Co., Ltd, 4 Piccadilly, Manchester & 6 Cherry Street, Birmingham BY Charles Hobson, Manchester, Second Edition 1920 (first publd. 1917). Attractive booklet, paper wraps, 31pp., 12mo. "Designed and published by Chareles W. Hobson [...]". Brett's was an insurance company, arguimng how essential they are to any business. No copy listed on COPAC etc. Illustrated trade catalogue of 'Cornices Mouldings and Ornaments from the workshops of G. Jackson & Sons Limited'. With separate price list and two supplements. + 30pp., folio. In brown printed wraps. Worn and aged, with some damp staining to the first dozen leaves. Printed on art paper, and with the thirty pages of the catalogue filled with illustrations of every aspect of the firm's stock, from 'Composition enriched pine panel mouldings' to 'Fibrous plaster cornices'. The price list is printed on 4pp., folio, in a bifolium, as is one supplement of 'Additional fibrous plaster cornices & bands and composition ornaments'. The other supplement is a fold out poster (44 x 28.5 cm) carrying illustrations of 'Cast lead word'. Three financial documents from 1880 on 'Vanity Fair': holograph 'Report' by the editor Thomas Gibson Bowles, accompanying 'Balance Sheet and Profit and Loss Account' and 'Comparative Statement of Income and Expenditure' by accountants Masson & Lewis. Bowles's report dated 10 November 1880. 'Balance Sheet' and 'Comparative Statement' both by Masson & Lewis, Accountants, 27 Leadenhall Street, London, and both for the half-year ending 30 September 1880. The three items, all in manuscript, are in good condition, on lightly-aged paper. All three are folded into the usual packets, with the two items by the accountants each titled in manuscript on the outside. 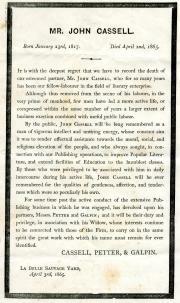 Item One (Gibson's report): 'Report to accompany the Accounts of "Vanity Fair" for the six months ending 30th. Septr. 1880'. In Bowles's autograph, and signed by him at the foot, 'Thos. G. Bowles | 10 Novr 1880'. 1p., foolscap 8vo. Itemised manuscript account of 'Mr. Alexr. J. Murray's Charges in relation to the Sale to Mr. Hanbury of 1/18th. Share in "Vanity Fair"'. Entries dating from 1 November 1881 to 1 July 1882. Document carrying tax stamp postmarked 14 March 1883. 5pp., foolscap 8vo. Attached with green ribbon. The sale was a protracted affair, and the detailed nature of these accounts may be due to Murray's desire to justify his charges of £22 1s 6d. The first entry reads: '1881 | Novr. 1st. Attending Mr. Bowles on his calling and receiving his instructions to act for all parties in the Sale of 1/18th. Share in "Vanity Fair" and General Roberts Executors would call and hand me the necessary papers [6s 8d]'. Other entries include 'Novr. 28th  Writing Mr. Bowles that the Deed would be ready for his signature tomorrow morning [5s]', 'Jany. Ten manuscript business letters, seven in English and two in French, from six different British wine merchants, to the French cognac house Messrs. Otard Dupuy & Co., placing orders, reporting news of the Brandy trade in Britain and shipping. From Aberdeen, Exeter, London, Liverpool , Stockton, Sunderland. Between 1828 and 1859. The ten items total 19pp., 4to. Each is a bifolium, with the address and postmarks on the reverse of the second leaf. Each is docketed by Otard Dupuy. All ten are in excellent condition, on lightly-aged paper. The six firms are: Bevan & Smith, Liverpool, two letters (both 1850); Christopher Bushell & Co., Liverpool (1859); John Currie, two letters, both in French: London (1828) and Stockton (1828); A. Leveau, three letters: Aberdeen (1849), Exeter (1850) and Sunderland (1850); William Strachan & Co, London (1828); George Wildes & Co., London (1828). Nine manuscript business letters from the Melbourne merchants and importers Curcier & Adet to the French cognac house Messrs. Otard Dupuy & Co., reporting news of the Australian brandy trade, shipping and other matters. The nine letters are in very good condition, on lightly-aged paper. Each is 1p., 4to., and all nine are bifoliums with the address and postmarks on the reverse of the second leaf. Each letter docketed by Otard Dupuy; one carries long notes in French by the house, and another calculations by them. The letter of 25 March 1874 gives a good indication of the tone of the correspondence: 'Dear Sirs | We confirm our list of the 25th ultimo and have yours of the 22nd. Autograph Letter Signed ('Francis Crossley') from the carpet manufacturer and Liberal Member of Parliament Sir Francis Crossley, explaining his reason for declining a dinner invitation. 1p., 12mo. On aged paper, with traces of grey paper mount adhering to the reverse. He thanks the unnamed male recipient for the 'very kind favor of the 23rd. Instant': 'my Parliamentary duties & business engagements demand so much of my time that I am obliged to decline, with but very rare exceptions indeed, all invitations of the character named'. He asks the recipient 'to have me excused complying with your wishes'. Signed Receipt ('Jo: Webb') for '2lbs. Bengal Cheroots', bought by 'Mr Smith'. 2 June 1852; 49 Friday Street, Cheapside, London. On one side of a piece of landscape 8vo grey wove paper. Clear and complete. Discoloured and worn, with spike hole at centre. Printed part of receipt reads 'London, ..........18..... | 49, Friday Strt. Cheapside. 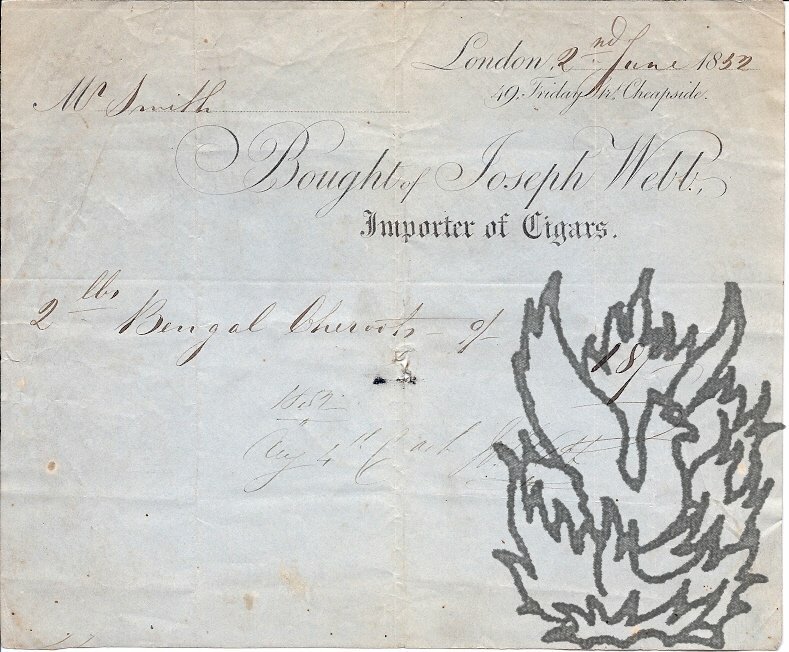 | M............ | Bought of Joseph Webb, | Importer of Cigars.' The bill is for '2lbs. Bengal Cheroots - 9/- | 18/-', with the receipt reading '1852 | Aug 4th. paid [signed] Jo: Webb'. Docketed on reverse 'Webb | 18/'. Webb does not appear to have traded from the site for very long, and little is to be discovered about him. Collection of correspondence from Elizabeth Arden Ltd to agents Franklyn and Doris Rogers, Messrs Titcumbs, Chatham, including an Autograph Letter Signed ('Elizabeth Arden') from Arden, and 40 Typed Letters Signed from director T. Gordon Yates. Between 1942 and 1956; most items on the letterhead of the Elizabeth Arden Ltd British headquarters at 25 Old Bond Street, London. The collection of fifty-three Typed Letters Signed and six mimeographed circulars, in various formats, is in good condition on lightly-aged paper, with all texts clear and complete, and with a couple of items with closed tears. Providing an interesting sidelight into workings of the English branch of one of the twentieth-century's leading multinational corporations. Arden's letter (8vo, 1 p), dated 8 April 1955, is addressed to the Rogers' daughter 'Miss J. Rogers'. Twenty-eight Typed Letters Signed, seventeen Autograph Letters Signed, etc, to K. W. Luckhurst, Secretary, Royal Society of Arts, and others. 1938-43; various letterheads, including 11, Old Cavendish St, W.1. ; Greengates, Sunningdale, Berks; and 35 Grosvenor Square, W.1. British businessman (1872-1955), chairman of the Medici Society Ltd, chairman and managing director of Henry Stone & Son Ltd, printers. Very good. Mostly octavo, with a few quarto and 12mo. Some bearing the Society's stamp and others docketed. Occasional rust marks from paperclips. Mainly concerned with the day-to-day activities of the Royal Society of Arts, of which Milne was a prominent member, around the time of the Second World War. On 7 September 1939: 'I hardly anticipate that you are likely to have trouble in regard to occupation of the premises. Twelve Autograph Letters Signed and one Typed Letter Signed to Sir Henry Trueman Wood, [Secretary,] Royal Society of Arts. 5 August 1913 to 9 September 1916; mainly on '3, YATELEY ROAD, | EDGBASTON' and University of Birmingham letterheads. British economic historian (1860-1927), a disciple of Arnold Toynbee, and proponent of the historical method pioneered in Germany by such scholars as Roscher, Hildebrand and Knies. The manuscript items are all 12mo, the typed item quarto. All twelve docketed and bearing the Society's stamp, and signed 'W. T. Ashley'. The collection is in very good condition, though grubby in parts and with one or two creased corners. An interesting and characteristic correspondence. ITEM ONE (3 pages, 12mo, 5 August 1913): Declines proposal to act as examiner. Three manuscript orders authorising payments, and three typewritten orders cancelling payments. 4to and 8vo. Somewhat grubby and creased, but in good condition otherwise. The six items, all addressed to Messrs Coutts & Company, are, in chronological order: ITEM 1, 5 manuscript pages, 4to, headed 'Duchy of Cornwall, | Buckingham Gate, S.W. | 1912. Two Autograph Letters Signed and Two Typed Letters Signed to Perry (1), Luckhurst (2) and Menzies (1), Secretaries, Royal Society of Arts. [18 August], 19 and 25 October 1937 and 31 January 1938; the first on letterhead of Canadian Pacific Hotels, the other three on City of London College letterheads. English traveller, writer and Governor of City of London College (1891-1991). First and last letters, two pages quarto; middle two letters, one page quarto. All in good condition and either docketed or bearing the Society's stamp. In first letter, further to a conversation, Duly asks if he can give a lecture on 'Ships sweat & condensation'. 'I have been away with a Leverhulme Fellowship on Carriage of Goods by Sea & am now on the Pacific Coast again where I find v. great interest in my previous papers & requests for a further account of more recent work. Coloured advertisement for Swan Vesta matches, in the form of a pastiche of a London Underground sign. Without date or place [1920s or 30s?]. Attractive illustration, in red, green, yellow and black, on piece of white card roughly nine and three-quarter inches by six and a quarter, neatly mounted on piece of black card roughly ten and a quarter inches by seven and three-quarters. At head a parody of the London Underground black rectangle over red circle, roughly six and a half inches by three and a quarter, bearing the notice 'ALIGHT HERE' in white letters. Beneath this the words 'FOR EVERY SMOKER. ', with a red arrow at foot pointing to a box of Swan Vesta matches. Very good, though lightly foxed. Printed facsimile of Christmas message on headed paper. Burn (died 1950) was President of the Institute of Actuaries, and a leading figure in twentieth-century British insurance. Dimensions five inches by eight inches. Folded once. In good condition on good thick wove paper. Headed by company crest with motto, between 'HOLBORN | BARS' and 'CHRISTMAS | 1921'. Reads 'With heartiest Christmas & New Year Greetings to all members of the Prudential Staff. | from | Joseph Burn | General Manager | & Actuary'.